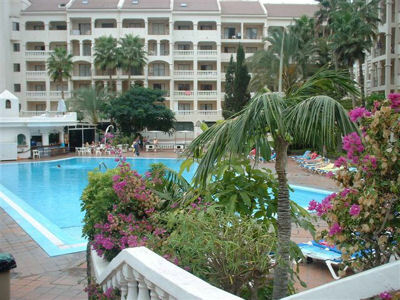 Castle Harbour is situated on the hillside above Los Cristianos, around 1km from the sea front. The location is a quiet area with a few shops, bars and restaurants to choose from. The complex is well maintained and clean, as well as being reasonably priced. The complex has a 24 hour reception, which offers various services including booking airport transfers, internet access, fax service, security safe rental, excursion tickets, car hire and money exchange. There is also a shower room available for guests to use and a luggage room, where guests can safely leave cases before departing for the airport. Towels can also be provided from reception for a small charge. 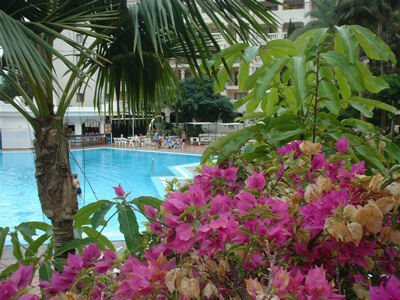 The large heated swimming pool is surrounded by sun terraces with sun loungers and parasols (small charge payable). There is also a separate section of the pool for children. A life guard is on duty daily for extra security. Tenerife South airport is just a short taxi ride away. There is a poolside bar called 'El Paso', which serves snacks and drinks daily. The restaurant next door is open every evening and serving international cuisine. Occasionally, there is evening entertainment on the terrace. There is also a tennis court within the complex grounds and a small bowling green. Equipment for both is available to rent from reception. A couple of pool tables are also available for guests to use. A self service laundrette is also provided with washing machines and tumble dryers. This is open daily.